Rose Louise (Sakel) Kahle, age 91, of Huntingburg, passed away at 4:23 a.m., on Monday, January 14, 2019, at St. Charles Health Campus in Jasper. She was born July 30, 1927, in Holland, Indiana to Elmo A. and Florence (Overbeck) Sakel; and married Edward H. “Ed” Kahle on November 27, 1954, at the Methodist Church in Huntingburg. 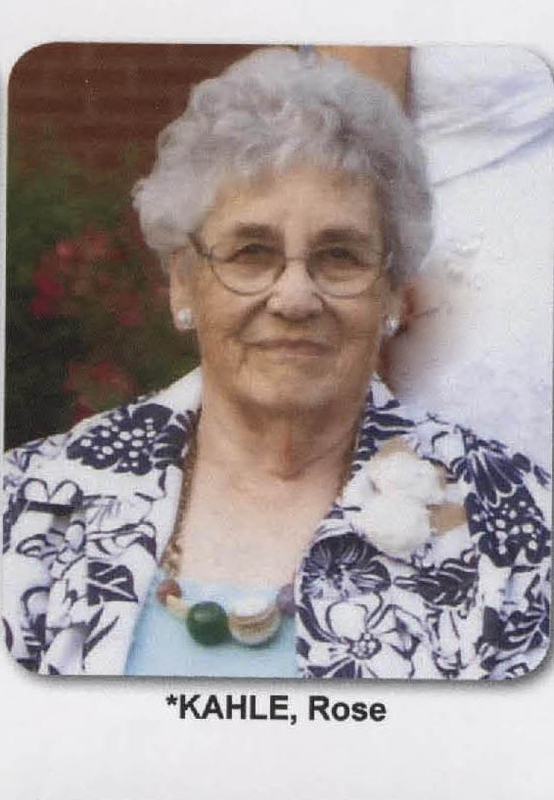 Rose graduated from Huntingburg High School; worked as a telephone operator and homemaker; was a member of St. Paul United Church of Christ in Holland where she was a long-time choir member; and enjoyed playing pinochle and spending time with the family. She was preceded in death by her husband, Edward H. “Ed” Kahle, who passed away on September 24, 2013; and one brother, Glen Sakel. Rose is survived by two sons and two daughters-in-law, John H. (Linda) Kahle of Jasper and Thomas E. (Regina) Kahle of Huntingburg; one sister, Lois Minto of Evansville; by (6) grandchildren, (2) step grandchildren, (6) great grandchildren and (1) step great grandchild. Funeral services for Rose Louise (Sakel) Kahle will be held at 11:00 a.m., E.S.T., on Friday, January 18, 2019, at St. Paul United Church of Christ in Holland with burial to follow at St. Paul U.C.C. Cemetery. Pastor Debbie Roe will officiate at the service. Friends may call for visitation at the Nass & Son Funeral Home in Huntingburg from 3:00-8:00 p.m., on Thursday, January 17th; and also at the church in Holland from 10:00-11:00 a.m., Friday. Memorial contributions can be made to St. Paul United Church of Christ in Holland.